Have you ever had a scary moment watching your little one teeter towards a staircase? Is it time to babyproof the stairs in your home? If you haven’t already started babyproofing your home, the stairs are a great place to begin. A child is injured on the stairs every 6 minutes (source). While the steps to babyproofing your stairs may not seem obvious at first, with a little care and know-how, you can ensure your home is accessible to you and safe for your little one. Which Stairs Should Be Babyproofed? When it comes to babyproofing stairwells, there’s one solid fact: there’s no way to safely let your child have access. You want to make sure you get both the top and bottom of the stairs sectioned off from your children. Since babies are well-trained escape artists, making things secured and restricted takes the pressure from your shoulders a little bit, while keeping them from dangerous and daring escapes. The most obvious and reliable way to keep your baby away from the stairs is to put up a secure baby gate and make sure it’s properly installed. There are plenty of gates to choose from to fit your home, but whichever you pick, make sure it completely blocks access to the stairs. Always make sure you’ve read instructions thoroughly anytime you’re setting up a baby gate. An unstable baby gate can lead to more risk and the chance for your baby to fall. Avoid using accordion baby gates and check to make sure your gates have not been recalled. The top of the stairs in particular will require special attention to mount the baby gate. You may have to have to drill into the banister and wall to get a secure mount. 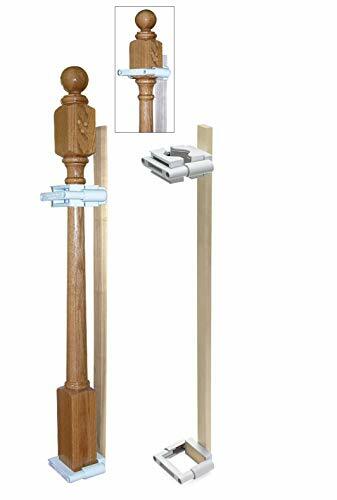 If this isn’t a good option for you, you could use a mounting kit that protects your banisters from drilling. 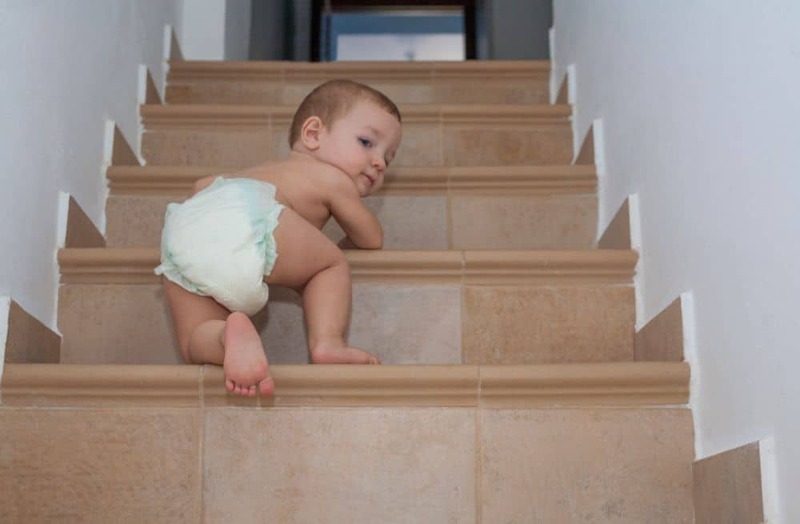 Sometimes stairs need maintenance — catching a flaw in them can be what prevents your child from getting hurt if they manage to get past a baby gate. Inspecting for rough edges, nails, or loose steps should be done frequently in a home with children, especially if you have to carry them up and down the stairs in your arms. Imagine stepping on a nail and falling with your baby! About a quarter of children’s stair related injuries happened while being carried by a parent. Knowing your house and identifying its babyproofing needs will be crucial in picking out the best baby gate for you. Take careful consideration of how your stairs are used and what’s important to you in a baby gate so you know what to look for and don’t waste time or money. Take a look around your home. Think about what it will be like when you set up your babyproofing tools. Frequency of use: Ask yourself how often your stairs are in use. High-traffic will need something like a swinging gate or a walk-through gate, unless you don’t mind constantly stepping up and over. Space requirements: You can get gates that cover large entryways or ones that simply sit in the doorways. If you’re trying to cut down on how many gates you need to get, consider a few large ones to section off entire rooms at a time. Consider the carrying: Take a look at the way your house is organized. Is your laundry room far from your bedrooms? Will you need to carry the baby up and down the stairs multiple times a day? A safer baby gate for high-traffic stairs may be needed. Style and designs: While safety always comes first, you can still try to find a baby gate that better matches your idea of what your house should look like. 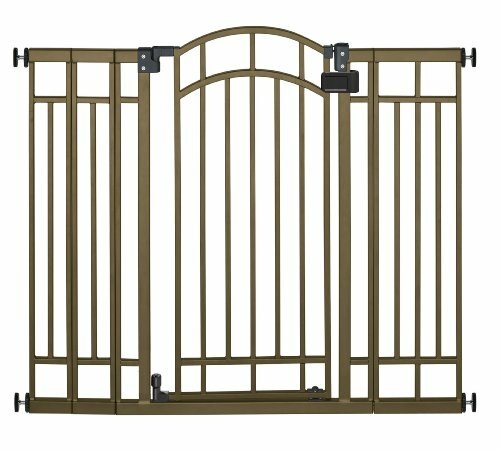 Choosing between wood, metal, or other colors can help the gate blend in better. Baby gates come in tons of shapes, sizes, uses, colors, and materials. Matching the best gate for your home with your stairs prevents accidents more than anything else, but choosing the right one can seem daunting. Lucky for you, we did some digging about the three best kinds of baby gates for you and your little one. Expandable baby gates are small, narrow gates that open slightly to fit right inside of a doorframe. Not every house will have stairs with a specific door frame at the top, but if yours does, this is a great little gate to restrict stair access. These are ideal for the foot of the stairs, since they use pressure-mounting to hold themselves. If a baby were to push against a gate like this from the top, it could slip and cause your baby to tumble down. Some expandable baby gates, like this one, include the necessary hardware and instructions for mounting at the top of the stairs. The idea behind 3-in-1 baby gates is they can be condensed into a safe playpen or extended out to cover large areas of space with unlimited extensions. These are perfect for homes with very open stairwells or ones with lots of things around stairs to protect. Expendable gates are great, but they come with risks too, and a swinging gate is a great solution. Using both, with the swinging gate at the top of the stairs, creates an improved flow through your house, especially if traffic is high on the steps. These gates are taller and often stronger, and require hardware to be safely mounted. Instead of having to be risky and step over a low gate and balance on the stairs these gates simply unlatch and swing open. The safety and convenience factors they add really help over time. Even if your baby is too big to slip through the banister railing, their head or limbs could get stuck between the slats and injuries can happen. This is a very frequently overlooked part of babyproofing your stairs and home. You can get a banister guard that goes along the length of your banister. They come in several different styles and materials to fit your home the best. They’re not exactly fashionable, but safe is always better than sorry. These are usually easy to put up, but you should make sure you test it before giving your little one access to your stairs by pressing on the guard. If you have the tools, time, and resources, making a custom railing guard can be really fun and a stylish way to stay true to your home’s decor. There are a few different methods for doing this, so search around to find the best one for your skills and budget. Believe it or not, I grew up in a home without a banister along the steep steps to the basement. I have this vivid memory of following my mom, slipping with her through the gate, and promptly starting to tumble right over the edge of the stairs. In my case, disaster was narrowly avoided when my dad noticed and caught me. After that incident, my parents installed railings to the stairs, and we never had another problem. Sometimes replacing your banister, or installing one if it’s missing, can be the best way to baby proof your stairs. You can easily do this yourself as a low cost project (source). Any stairs in your home will need to be babyproofed, no matter how big or small. Steeper staircases will need extra attention, but there should be restriction taking place for any sets of steps in the house. In some cases, there may a single step in your home leading from one room to the other. We had this in my home growing up, too. The best way I found to handle it is to place an expandable baby gate to be safe. It’s the better option than your toddler tripping, slipping, or falling because of the little step. There’s always more you can do to increase the safety of your house. How far you take your babyproofing depends on your family culture and the time and resources you’re willing to dedicate to the task. You have to modify to your own personal comfort level. When I was going through the babyproofing process, my mom would laugh and remind me that parents have kept children alive for years without all the fancy gadgets and additional steps. Did it stop me from going overboard? Not really. Through my excessive babyproofing phase, I came across these helpful little tips that improve stair safety in your home. These are best for a little later on when your child starts using the stairs for themselves. Declutter, declutter, declutter! I can’t stress this tip enough. In my house, the stairs somehow manage to accumulate toys, books, and clothing. It’s pretty obvious why these are dangerous things to have on the stairs, especially if you have a toddler who is just getting the hang of the climbing. A misstep onto a shirt or a slip because of a book can throw away all your careful babyproofing. As a general rule, carpeting is always better for your kids than hardwood flooring. Not only does it cushion falls, prevent slips, and offer a better grip for small feet, it’s a great way to protect the stairs themselves. Choosing to carpet your stairs might not fit into your plans easily, but the next time you’re doing home improvements, consider this. It can be beneficial to you, too, if you’re constantly carrying the baby up and down them. When you’re tired, it’s easier to fall or make a wrong step. You read that right: remove baby gates — when your little one reaches a certain age. When your baby starts learning to climb, baby gates become a hazard. Despite vertical bars to deter climbing and secure mounts, once your child is about 2 years of age, you need to do without them. For families with more than one child, this could become a problem. Large area gates like a 3-in-1 gates can become handy at this point to leave the stairs open, but provide restriction for certain youngsters. You can also start teaching your older toddlers early how to safely climb stairs. The good news is there really isn’t much you can do to mess up babyproofing your stairs as long as you follow your manufacturer’s instructions on your baby gates. By testing all of your babyproofing decisions for any weak spots, you’ll notice risks on your own. Still, there is always a chance for oversight. If you’re still concerned, here’s a quick list of things you should avoid when babyproofing your stairs. Waiting for the last minute to install your baby gate causes stress and leaves too much room for error. You should babyproof before the first sign of mobility even appears in your little one. Getting used to the gates before they’re absolutely needed is a smart idea, too. This is especially true if you have ones that latch to allow you to walk-through. You don’t want to forget to shut it behind you, or start tripping over them at night. Kids are really crafty, and they’re surprisingly able to fit through tiny spaces. Needing a taller gate is a common problem with parents, but one of the worst mistakes you can make when babyproofing is putting your baby gate a few inches off the ground instead. You may be gaining height, but you’re adding instability as well as the opportunity for your little one to slip under and tumble down. Make sure the baby gate you buy is tall enough to restrict your child. If your baby ends up growing too fast and the baby gate becomes a hazard, either get a new taller one, or think of a new way to restrict access. Few things are more frustrating then attempting to put up your baby gate and realizing your doorway is too wide. It can be tempting to just put two gates together to extend the width, or even stack them for height. Doing this can be really dangerous. You’re making both gates unstable by misusing them, as well as creating a curious hazard for babies to explore. Any time you deviate from the manufacturer’s directions, you’re creating more risks for your baby. I’ve seen some crazy contraptions before when it comes to baby gates, and I can firmly say none of them have been safe. If you’re using a baby gate, don’t modify it in any way that isn’t approved by the manufacturer. This includes raising it above the ground and shoving towels underneath or putting wooden blocks on the sides of the gate to make it fit into a doorway. If the shoe doesn’t fit, the shoe just simply doesn’t fit. A good way to avoid any of this frustration and temptation from happening is to carefully and accurately measure your doorway beforehand and check the measurements of the gates you plan to buy. Don’t even bother getting one that doesn’t fit your numbers. Making stairs one of the entirely off-limits places for children under the age of two can help prevent tons of injuries. By choosing the right baby gate and making sure you follow directions instead of modifying them, you can ensure safety for your little ones, and security for you. Do you have any tips for babyproofing stairs? Did this guide help you with some babyproofing know-how? Let us know in the comments below! Or if you know parents preparing to babyproofing, share this with them and spread the knowledge!